Though literary tenses are nowadays reserved for written French, they were once common in spoken French, offering nuances that no longer exist today (a loss which some lament as l’appauvrissement du français – “the impoverishment of French”). They’re sometimes used in jest to make the speaker sound refined (or stuck-up). You probably don’t need to know how to conjugate literary tenses yourself, but you do need to be able to recognize the patterns and the conjugations for regular verbs and the top French verbs at least. Of course, if you read a lot, you should memorize even more. 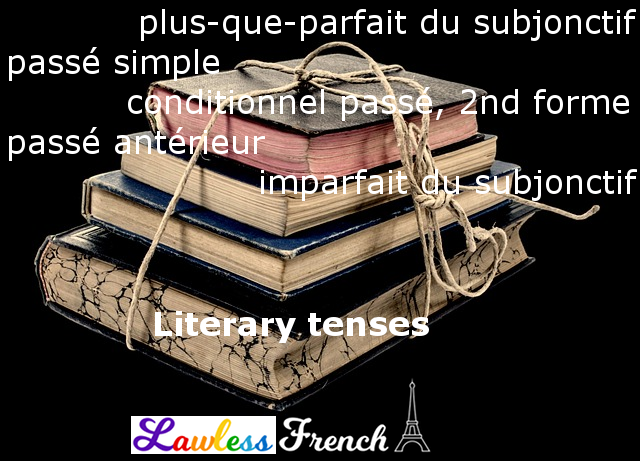 * Interestingly, though literary tenses are generally considered "advanced" French, literary tenses – especially the most common one, le passé simple – are used in all fiction, including children’s books. 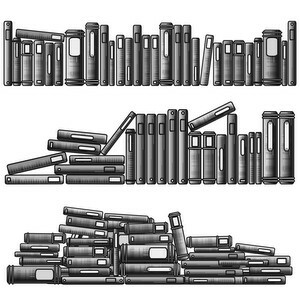 Each French literary tense has an equivalent in everyday French. Click any link for conjugations and detailed usage notes. Though the passé simple is a literary tense and therefore restricted to writing, the English equivalent (simple past) is still alive and well, as is the distinction between passé simple and passé composé (present perfect). > J’ai mangé. I have eaten. Like the simple past, the passé simple describes a completed action with no link to the present, in contrast to the the passé composé (present perfect) which shows that there is a link with the present. Le passé anterieur is used to describe an action that took place before another action (which is in the passé simple). In English, there is no distinction between le passé antérieur and its non-literary equivalent, le plus-que-parfait – they are both translated by the past perfect. Une fois qu’elle fut partie, je mangeai. Once she had left, I ate. > Une fois qu’elle était partie, j’ai mangé. Once she had left, I ate. Obviously, the French imperfect subjunctive distinguishes itself from its non-literary equivalent, the present subjunctive, by dint of the fact that it’s in the past. The difference is that the imperfect subjunctive is called for in literature when the main clause is in the past tense. Elle ne croyait pas que je mentisse. She didn’t believe I was lying. > Elle ne croyait pas que je mente. > Elle ne croyait pas que j’aie menti. She didn’t believe I lied. Elle ne croit pas que je mente. She doesn’t believe I’m lying. In English, "I lied" can indicate a past tense or a statement about an ongoing action: I lied = I lied at a certain point in the past OR I lied in general (I was a liar). The imperfect subjunctive distinguishes between these two possibilities. Elle n’avait pas cru que j’eusse menti. She hadn’t believed that I’d lied. > Elle n’avait pas cru que j’aie menti. She hadn’t believed that I lied. The subtle nuance lost here is a combination of two distinctions: passé simple vs passé composé as well as imperfect vs present subjunctive. Using the pluperfect subjunctive puts the lying farther into the past than the past subjunctive, which has a thread connecting it to the present (like the passé composé does). The second form of the past conditional (which is identical to the pluperfect subjunctive) is slightly stronger than the non-literary past conditional: it stresses the fact that the action did not occur. S’il fût tombé, j’eusse pleuré. If he had fallen, I would have cried. > S’il était tombé, j’aurais pleuré. If he had fallen, I would have cried. The present subjunctive can be used for literary commands. Ne … pas becomes ne … point in literary French. Ne can be used on its own to negate a few verbs. Several non-literary tenses are used in a special way in literature: historical tenses.